Presence (application/pidf+xml) seems to be less often used than "regular" BLF (application/dialog-info+xml), in particular with desk phones. Example icons for this buttons (check.bmp for online, cross.bmp for offline) are supplied in /img subdirectory. After starting this ad-hoc notifier subscribe to event with tSIP. Configure tSIP with account with no registration (expires = 0) and use full SIP URI (e.g. 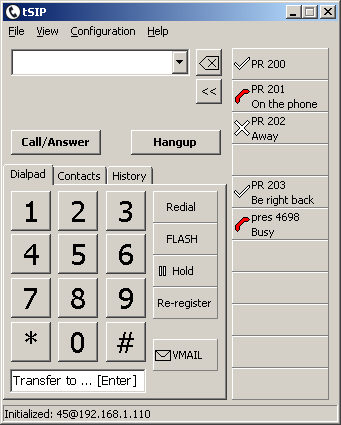 sip:number@your_ip) as number entered in presence button configuration for p2p. Use "T" command to change status in pjsua. Few other examples of application/pidf+xml body (RCUSS Server): presence.txt.